The HGTV Dream Home Giveaway 2018 is here. To celebrate, DIYNetwork.com and flooring experts Lumber Liquidators are teaming up to bring you the annual Lumber Liquidators Dream Floor Giveaway. This year’s Lumber Liquidators Sweepstakes offers one winner the chance to win $5,000 in flooring and $2,500 in cash for a dream floor. And all you have to do is register at DIYNetwork.com/DreamFloor between December 27 and February 16, 2018. Entering this Lumber Liquidators Sweepstakes to win a dream floor and fairly easy and requires you to complete just a few steps, as outlined below. Go to DIYNetwork.com/DreamFloor starting on December 27, 2017 to get started. Enter your email address and hit the “Begin Entry” button. Fill out the entry form with required information like your name, address, phone number, date of birth, cable provider. Click “Enter Now” to move forward. Increase your chances of winning by repeating these three steps daily during the Promotion Period. The Grand Prize will be awarded in the form of a gift certificate redeemable for $5,000 in flooring products from Lumber Liquidators and $2,500 cash. In order to participate in the Lumber Liquidators Dream Floor Giveaway 2017, entrants must be legal residents of the 48 contiguous United States or D.C. who are 21 years of age or older as of December 27, 2017. This Lumber Liquidators Sweepstakes starts at 9:00 a.m. ET on December 27, 2017 and ends at 5:00 p.m. ET on February 16 2018. The potential Grand Prize Winner will be selected in a random drawing, by an independent judging organization, from among all eligible entries on approximately March 6, 2018, and will be contacted by phone on or about March 9, 2018. Approximate retail value of the Grand Prize is $7,500. Sponsored by Lumber Liquidators, Inc., 3000 John Deere Road, Toano, VA 23168. 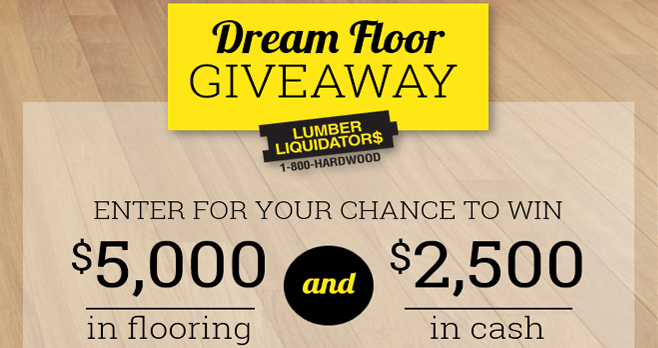 For more information on the Lumber Liquidators Dream Floor Giveaway 2017, including official rules, visit DIYNetwork.com/DreamFloor now!